When Matt tried to kill Barry with his car, the two brothers went their separate ways. Barry moved to Atlanta and Matt stayed in the family home in Aiken Mill, Virginia. One day Barry is notified that Matt disappeared. Since he lost his job and his girl, he returns home and is shocked by the damage someone did to his house. Even more perplexing is the word Lebo painted in Matt's room in cow's blood. The first night he is in the house strange things happen like a glass moving of its own volition; Barry hears strange inhuman noises and the word Lebo starts to glow. Jennifer Brand joins Barry in seeking answers. Since she is a gray mage, she senses the dark forces gathering around Barry and his house. They learn that Matt rented a room to Ren, a practitioner of the dark arts, who intends to invoke a spell that will require a blood sacrifice, preferably Matt's but Barry will do in a pinch. The two Riggs brothers and Jennifer try to stop him. Slow starter, but strong finish! What made the experience of listening to The Lebo Coven the most enjoyable? Barry and Jennifer....Barry for his open mind and Jennifer for her love! Which character – as performed by Chris Andrew Ciulla – was your favorite? See Above...and stop asking this question after the above one...its basically the same question twice...and its repetitive...and unnecessary! This book put me through a whole gambit of emotions....from terror to sorrow....it is really a kind of creepy spooky story! Barry comes home after being informed his brother Matt is missing to find a thrashed house, and a whole heap of spooky stuff going on! He meets up with Jennifer an old high school acquaintance whom he had treated very poorly, due to a disability...well they form a bond, and he learns Jennifer can feel energies and is a practitioner of magic..well there is a bad spirit in Barry's childhood home...Matt is no where to be found and Jennifer is all Barry has to help him and possibly save his life! 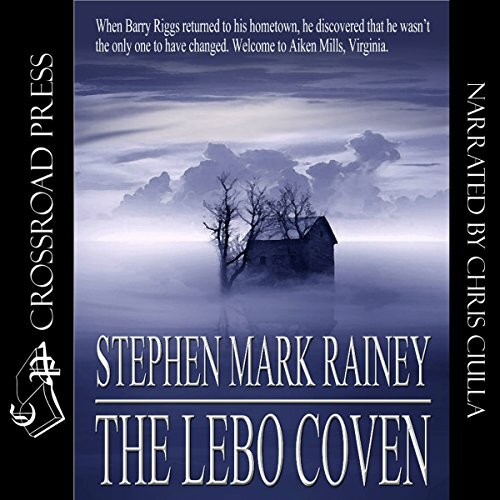 Slow starter, but a spooky good story, with good narration, and well worth a listen! I recommend! Chris Andrew Ciulla narrates this book with great feeling.Barry returns 'home 'after a call saying that his brother is missing.Years earlier the brothers parted company after Matt tried to run over Barry with his car.When the parents died Matt got the house.Barry is astonished at the destruction that happened to the house when he arrives.Every room has been ransacked and on a bedroom wall is a name,LEBO, written in cows blood.Barry starts seeing and hearing things and invites an old school mate in to see what she...and her weird witchy ways,can make of the situation.There are twists and turns and quite an ending,that I won't give away.